With a simple cut and paste job by the Octagon’s graphics department, the official event poster for “UFC Fight Night 24” is once again complete. The billboard was redone just in time for Saturday’s show inside the Key Arena in Seattle, Washington. 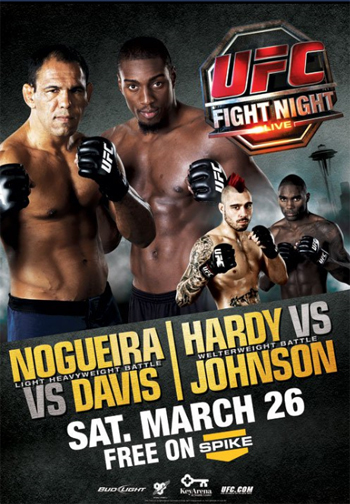 A critical light heavyweight affair between Antonio Rogerio Nogueira and Phil Davis will headline the show. Little Nog was scheduled fight Tito Ortiz, but an injury forced “The Huntington Beach Bad Boy” off the Spike TV broadcast. Davis was instantly dubbed Ortiz’s replacement. “Mr. Wonderful” was stuck in the mud after Matt Hamill was pulled from their UFC 129 matchup. Hamill is now facing former light heavyweight champ Quinton “Rampage” Jackson at UFC 130. Although Davis was hoping to showcase his skills in front of 55,000ish screaming Canadians at UFC 129, a headliner spot opposite an MMA legend is a decent consolation prize. Spike TV will broadcast the event live at 9PM ET/6PM PT.